Following last month’s death of long-time Texas baseball coach Augie Garrido, Jim Grass looked back on his brother-in-law’s autobiography. 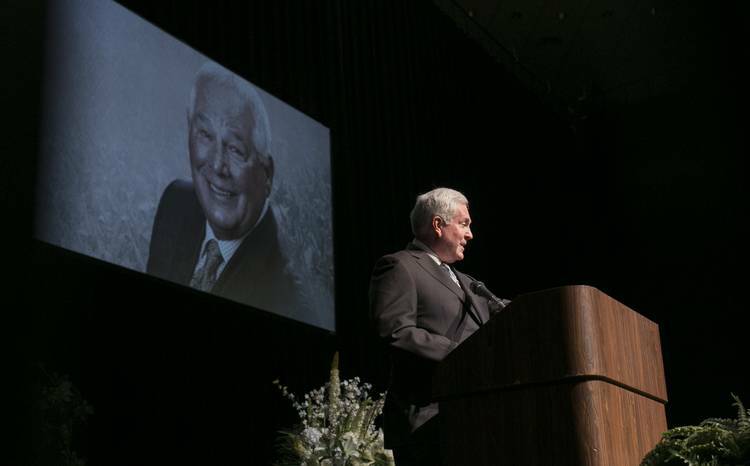 Grass was among those who did things right at the Erwin Center on Monday at a celebration of life service for Garrido, who passed away at age 79 on March 15 after suffering a stroke in California. Garrido’s life was celebrated by family, friends, fans and former players. Among those in attendance were Mack Brown, Rick Barnes and Jody Conradt, UT’s former football, men’s basketball and women’s basketball coaches who coached with Garrido. David Pierce, Garrido’s successor, attended as did a dozen Longhorns players. Texas women’s basketball coach Karen Aston and athletic director Chris Del Conte also came to pay their respects. During the two-hour service, songs were sung by the Longhorn Singers and local artist Roderick Sanford. “The Eyes of Texas” was performed by the Longhorn band. Two videos were played, one of which was narrated by Kevin Costner, a friend of Garrido’s. A letter of condolence from former President George W. Bush was read. Tears were shed by Brown and fellow speakers Huston Street and Joe Martelli. Plenty of stories also were told. Street, a 13-year MLB veteran, spoke of Garrido’s dismissal of the concept of pressure. Former UT athletic director DeLoss Dodds drew a laugh when he claimed Garrido’s cooking show was the only coaching show he’d watch on Longhorn Network. Martelli, who played and coached at Cal State Fullerton, said Garrido refused to use sub-par facilities as an excuse as he was building the Titans into a national power. Former Texas bullpen catcher James Barton regaled about Garrido motivating the Longhorns by locking them out of their locker room ahead of a run to the 2014 College World Series. Along with Texas basketball coach Shaka Smart, Barton also shared the last text message he received from Garrido. Mark Kotsay, who won an NCAA title with Garrido at Cal State Fullerton before embarking on a 17-year MLB career, issued a reminder that Garrido was the last person to take credit for his team’s successes. Kotsay discussed the meaningfulness behind Garrido’s fabled rants and life lessons. He asked the attendees to put their horns up to honor Garrido. Kotsay also used the analogy of a home run — somewhat ironic, considering Garrido’s penchant for small-ball baseball — to describe the legacy left behind by his coach. With a career record of 1,975-951-9, Garrido is the all-time winningest coach in college baseball’s history. He won three national championships at Cal State Fullerton before guiding the Longhorns to NCAA crowns in 2002 and 2005. Dodds recalled on Monday wanting to hire Garrido after he was impressed by a post-game interview given by the coach when he was still at Fullerton. Garrido was eventually tabbed to replace Cliff Gustafson, and he won 824 games with the Longhorns from 1997-2016. Garrido recently served as a special assistant to the athletic director at Texas. Garrido is survived by his wife, Jeannie, and daughter, Lisa. Garrido was buried at the Texas State Cemetery on Sunday, next to former UT football coach Darrell K Royal.